Rosarie O’Donovan, Chairperson CLA, Kathleen O’Leary Keating Voluntary Director CLA, Christy Collins, Voluntary Director CLA, Dr. Madden, Voluntary Director CLA, John Deasy, Voluntary Director CLA, Una Kingston, Voluntary Director CLA presenting €600,000 to Mr. Tony McNamara, CEO – Cork University Hospital & Ms. Marie Watson, Clinical Nurse Manager – Cork University Hospital. The Board of Directors of the Children’s Leukaemia Association are delighted to announce that we are now in a position to fund the new Children’s Leukaemia and Cancer Unit at the new Children’s Hospital at Cork University Hospital. Funding this wonderful new state of the art facility, which will be a Centre of Excellence for medical care for children in the Munster region, will ensure that these sick children and their families are provided with the best possible hospital experiences as they battle their very serious illness. The Children’s Leukaemia Association is delighted to be part of this new Development and look forward to working together with the Management and Staff of Cork University Hospital to ensure we can provide the vital support services to the new Unit and the families attending there. The new Paediatric Haematology/Oncology Unit in Cork University Hospital is a self contained ground floor unit with access to an external landscaped garden, consisting of: 4 large single inpatient with isolation and parent sleeping facilities, fully ensuite 3 outpatient chemotherapy spaces Support accommodation including nurses station, clean and dirty utility, play area, housekeeper rooms, stores, pantry and toilets Parent lounge and dining area. 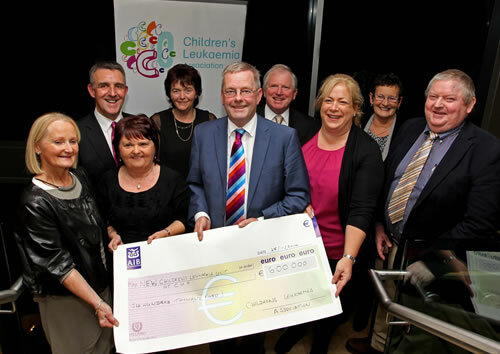 The Children’s Leukaemia Association are very proud to have raised €600,000 which will go towards funding the new Children’s Leukaemia and Cancer Unit. The CEO of Cork University Hospital Mr. Tony McNamara said “this is a remarkable achievement and it is a pleasure to work with the Children’s Leukaemia Association for the benefit of children. I look forward to working with them on the completion of this major development which will provide a State of the Art facility for children with Leukaemia”. For over three decades the Children’s Leukaemia Association has been fundraising through various events and donations. At times, this has been a difficult challenge, but thanks to the generosity, support and kindness of our fantastic fundraisers and friends the Children’s Leukaemia Association can now fund this wonderful new Unit. Many of our loyal fundraisers, who over the years have put in so much time, effort and energy year after year so they can help the Charity provide the vital support services that help so many families during this difficult time in their lives. Needless to say, without our fundraisers we would not have been able to achieve what we have achieved to date. It is through their efforts and selfless endeavours that this new Unit is being funded and we hope they are as proud as we are. Finally the voluntary Board of Directors and everyone involved in the Children’s Leukaemia Association look forward to the future care of children with leukaemia and cancer and the advanced treatment methods that this wonderful new Development will bring to the area.